Here are a few charts of different asset classes with my Meridian Theory applied through their respective trends. Each chart utilized the same reference dates as crosses to establish the meridians. In essence, the shading represents time periods where the markets are at a disequilibrium with the trend. In my unified theory (tongue in cheek once more), the meridian represents an equilibrium, which could be construed as the overlap between Soros's theory of reflexivity and traditional equilibrium thought. This makes rational sense, since it has typically represented where the market has either found equilibrium - or lost it altogether. 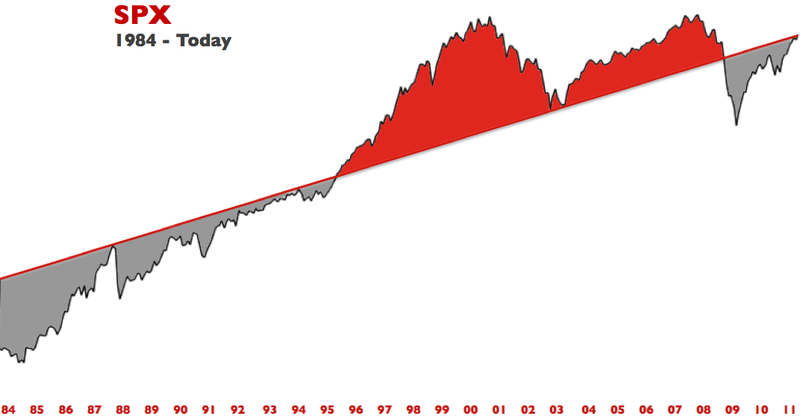 In 1987, it represented the top of the trading range out of the historically depressed markets of the 1970's. The gains were steep, the programs misfired, mass psychology took over and the rest is history. After the 87' crash, the market eventually made its way back to equilibrium and crossed the threshold right before Greenspan invoked the self fulfilling prophecy that was Irrational Exuberance. 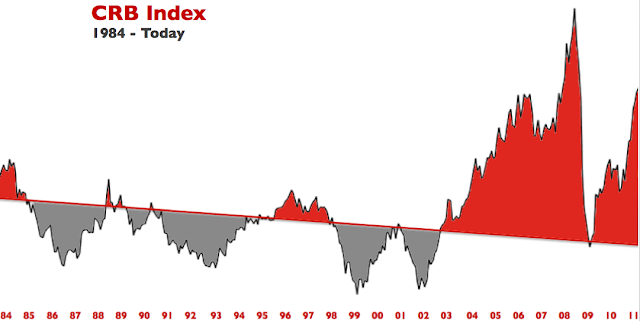 In 2002 and 2003, the market found its balance at the meridian and started its reflationary ascent to the 2007 highs. In 2008, it represented the threshold where the markets lost their footings - due to the financial crisis, and crashed. Today, with the exception of the commodity and gold sectors, these markets have worked their way back to equilibrium - as represented on the charts. Click to enlarge the charts. Assuming all things are relative, and the kinetic intra-market/asset class relationships still apply - you can see why George Soros believes that the gold market is the largest asset bubble of the day, and by extension the commodity complex as well. This is not investment advice. Erik Swarts is not a registered investment advisor. Under no circumstances should any content from this website be used or interpreted as a recommendation for any investment or trading approach to the markets. Trading and investing can be hazardous to your wealth. Any investment decisions must in all cases be made by the reader or by his or her registered investment advisor. This is strictly for educational and informational purposes only. Mr. Swarts may have numerous positions within the market at any given time that are not disclosed of at the time of publication. All opinions expressed by Mr. Swarts are subject to change without notice, and you should always obtain current information and perform the appropriate due diligence before making any investment or trading decision. All efforts are made to ensure that the information contained within the site is factual and accurate - however, Mr. Swarts does not guarantee its accuracy under any circumstances.